One of the most common problems when using a network firewall is that it sometimes blocks network traffic that you want to allow. This article explains how to see if a firewall is the problem. Error message occurs after installation when trying to run the software, often ‘cannot connect to server’ or ‘cannot connect to license server’ type of message. This is a common problem that most people encountered when installing new software applications. Firewall is a software program or a piece of hardware installed on the network that filters or block network traffic based on rules setup by system administrator or vendors. When the software requires communication between one or more computers (or Internet) and there is a problem, a firewall if often blocking communication. 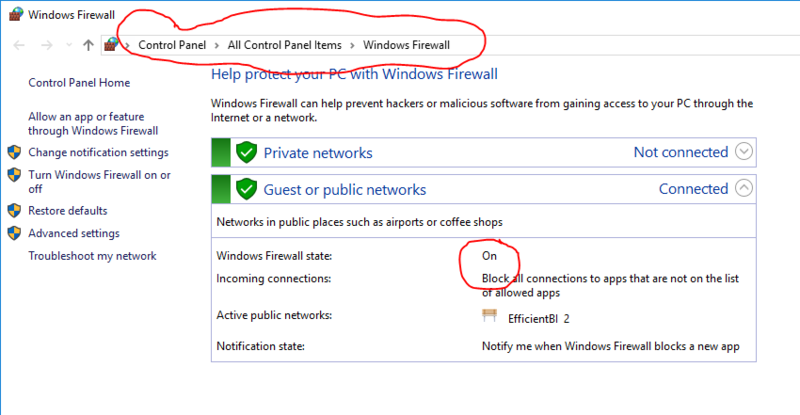 The easiest way to determine if Windows Firewall is the cause of the problem you are experiencing is to check if the Windows firewall is ‘On’. If it is, you can try to turn if off and see if you still experience the same problem. If the problem goes away, then Windows firewall is likely the issue. Please note that in most corporate environment, Windows Firewall may be replaced by 3rd party software from IT security software companies such as Symantec, Macaffee, Trendware, etc. In that case, you may want to engage your IT department for assistant. If the problem is related to firewall, then you either need to turn off the firewall or add an exception to the firewall that will allow the required traffic to go through.